The Lake Superior Agate was named state gemstone in 1969. 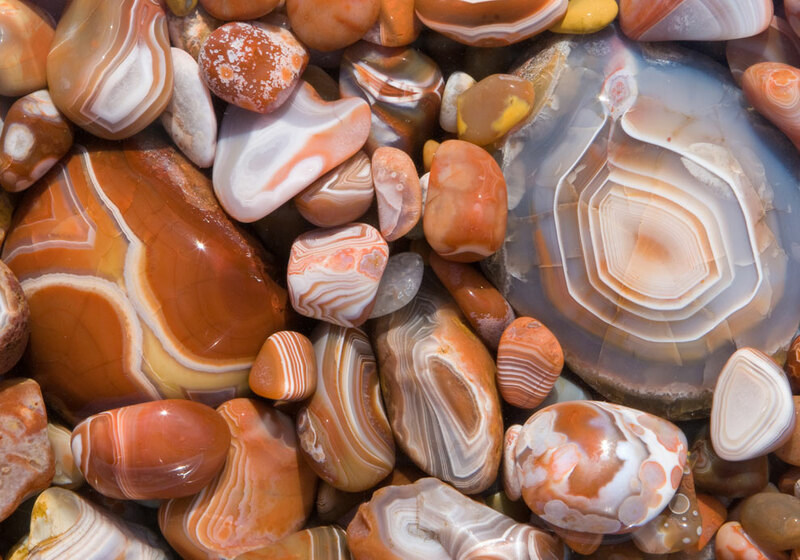 The Lake Superior agate was named the official state gemstone in 1969. It is an unusually beautiful quartz stone banded with rich red and orange colors derived from iron ore in the soil. Most agates are about the size of a pea, but some are as big as bowling balls and weigh over 20 pounds. Small agates often are polished to make jewelry; larger “lakers” of up to a pound often are cut into thin slabs to display the colored bands inside. Lake Superior agates, having been dispersed by glaciers in the last Ice Age, are found in northeastern and north central Minnesota. The specimens seen here, in the foreground, were photographed on one of Lake Superior’s many gravelly north shore beaches, near Castle Danger.